Cézanne's paintings after about 1895 are more somber, more mysterious than those of earlier years. His colors deepen, and his brushwork assumes greater expression. Spaces become more enclosed. Compare this landscape with Houses in Provence: The Riaux Valley near L'Estaque, c. 1883, executed 20 years earlier. Acquired 1907 by (Ambroise Vollard [1867-1939], Paris); sold to Marius de Zayas [1881-1961]. Purchased by Edward Steichen [1879-1973] for Eugene [1875-1959] and Agnes Ernst Meyer [1887-1970], Mount Kisco, New York, and Washington, D.C., by 1921; gift 1958 to NGA. On Vollard acquisition, see John Rewald, The Paintings of Paul Cézanne: A Catalogue Raisonné, New York, 1996, no. 937. According to Cezanne, exh. cat., Grand Palais, Paris; Tate Gallery, London; Philadelphia Museum of Art, 1995, no. 189. Regarding Steichen's role, see letter dated 12 July 1977 from Katherine Graham in NGA curatorial files. Lent by the Meyers to the 1921 Loan Exhibition of Impressionist and Post-Impressionist Paintings at the Metropolitan Museum of Art. Possibly Salon d'Automne, Grand Palais, Paris, 1907, no. 49. Second Post-Impressionist Exhibition, Grafton Galleries, London, 1912, no. 2. The Modern Gallery, New York, 1916. Loan Exhibition of Impressionist and Post-Impressionist Paintings, The Metropolitan Museum of Art, New York, 1921, no. 23. Loan, The Metropolitan Museum of Art, New York, 1923. Cézanne: The Late Work, The Museum of Modern Art, New York; Museum of Fine Arts, Houston; Grand Palais, Paris, 1977, no. 34, repro. Impressionist and Post-Impressionist Masterpieces from the National Gallery of Art, Washington, State Hermitage Museum, Leningrad; State Pushkin Museum of Fine Arts, Moscow, 1986, no. 37, repro. Cézanne, Galeries nationales du Grand Palais, Paris; Tate Gallery, London; Philadelphia Museum of Art, 1995-1996, no. 189, repro. Loan to display with permanent collection, Hamburger Kunsthalle, Hamburg, 1998. The Year 1900: Art at the Crossroads, Royal Academy of Arts, London; Solomon R. Guggenheim Museum, New York, 2000, no. 212, repro. (shown only in New York). Alfred Stieglitz and His Circle: 1905-1930, Musée d'Orsay, Paris; Museo Nacional Centro de Arte Reina Sofia, Madrid, 2004-2005, no. 42, repro. (shown only in Paris). Right Under the Sun: Landscape in Provence from Classicism to Modernism (1750-1920), Centre de la Vielle Charité, Marseille; Montreal Museum of Fine Arts, 2005-2006, no. 38, repro. (shown only in Montreal). 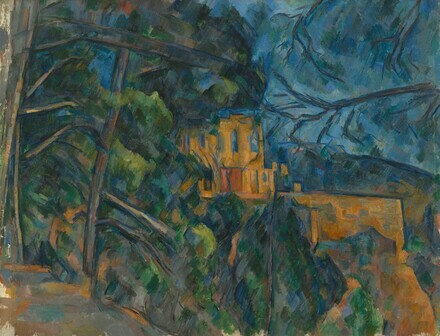 Cézanne and Beyond, Philadelphia Museum of Art, 2009, pl. 5. Cairns, Huntington, and John Walker, eds. A Pageant of Painting from the National Gallery of Art. 2 vols. New York, 1966: 2:460, color repro. Watson, Ross. The National Gallery of Art, Washington. New York, 1979: 120, pl. 107. Walker, John. National Gallery of Art, Washington. Rev. ed. New York, 1984: 507, no. 755, color repro. Rewald, John. The Paintings of Paul Cézanne: a catalogue raisonné. 2 vols. New York, 1996:no. 937, repro. Kelder, Diane. The Great Book of French Impressionism. New York, 1997: no. 375, repro.